This is the story of a boy’s spirited survival within a world of Nazi darkness and pervading death. Gregory Gregoriadis was born in Athens, Greece. He is Professor Emeritus at the University College London, and is the Founder of Xenetic Biosciences Inc., a USA-based biotechnology company. He lives in London. Still the Cicadas Sing is his first novel. 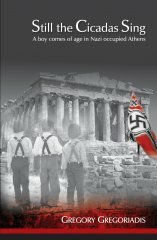 "The author did a masterful job... A unique perspective of plausible events around the suffering of Greece during WWII." An epic, spell binding novel. Set in Athens during WW2 Nazi occupation - with harrowing accounts of untold suffering and the fortitude of of Greek spirit whilst under siege - an evocative story unfolds... One of friendships, betrayals, intrigue, survival; interwoven with a haunting, poignant love affair which captures the imagination. With profound insight, the writer exposes Life's vicissitudes - through a journey of philosophy, patriotism, pathos and passion - to reveal the extent of human endurance whilst there is hope. This book, both inspirational and deeply moving, is a remarkable achievement. Recommended to be of universal appeal; worthy of the highest accolade! Wonderful book! It brings this period fully alive as seen from the intense perspective of a young boy navigating the usual rocky passage to adulthood in a very difficult world. A truly inspirational read! This book is beautifully written, lyrical and immensely human, and it deserves to win. Extraordinary, brilliant, a masterpiece. I just couldn't put it down. The story telling is superb, the language virtuoso. It is immensely moving. An illuminating window into life in Nazi-occupied Athens and beyond. I hope the author will write more. An enthralling read, a story I wish it never to end. A wonderful childhood in late 1930s Athens marred by war, invasion and occupation by the Nazis. Famine and executions,friendships and betrayal,all weaved together with romance and tragedy, portrayed vividly in a multitude of alluring scenes difficult to forget. The language was rich, colourful and poetic. At times I thought I was watching a movie. Such was the power of narration. Strongly recommended.